ygp2BC4, a photo by mainerunningphotos on Flickr. Last night Ward and I were sorting through the totes in the attic because we're going to have a yard sale next weekend. We came across a box of photos and near the top was a newspaper clipping with this picture on it. 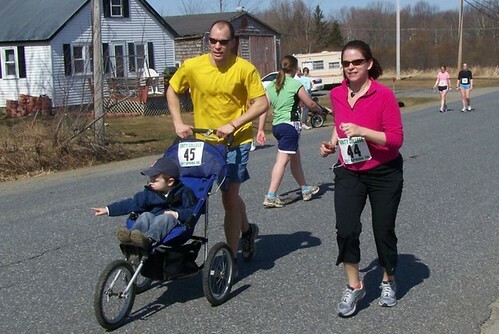 I couldn't remember which year we did the Unity 5k, but after a little researching on Maine Running Photos - found our names and my 1st (I think) time ever - 31:09. I've come a long way, haven't I? It's downright scary looking at this photo of me. This is my inspiration to NEVER stop running EVER. And what's worse? Ward looks exactly the same. Well, maybe he has more hair. Oh & Jill totally smoked me in this race!